Budgeting and planning for the upcoming year (or quarter or month) is a valuable opportunity for a business to identify goals, and excite and align employees. Unfortunately, most planning processes elicit eye rolls and cringes from the C-level down. Running an effective planning process takes a unique set of skills. Large companies have a team of people running the process who, collectively, may possess the required skills, but small companies often don’t have the resources available to make the process effective, efficient, and valuable to the whole organization. Below are a few principles that should guide the planning process. Gathering good information about the prior year may seem obvious, but often this step is overlooked or undervalued. Use the planning process as an opportunity to look for insights that may not be apparent in the company’s standard periodic reporting. How did the investment in business unit A effect business unit B? What products or services are trending and with which customer segments? What expense metrics have crept out of the normal range over the past few years? Why? Work with your key team members to understand where they see challenges and opportunities for growth. With good information and buy-in from key leaders, strategic objectives can be identified. However, when resources are constrained, strategic objectives will create differing amounts of stress on each department. These pressure points can be divisive if not presented within the context of agreed upon strategic objectives. 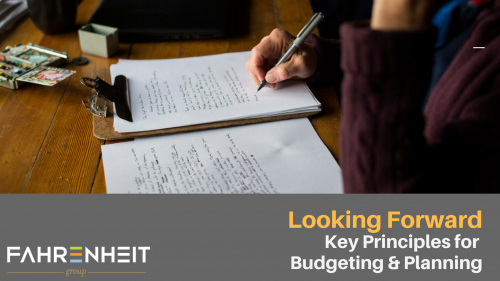 Often, getting buy-in from leadership is often the most difficult facet of the budgeting and planning process. Lack of alignment originates from competing agendas, personal expectations, and pride. These are difficult, people-based issues. The solutions to alignment issues are nuanced. They require a lot of listening, honesty, and trust. Cultivating healthy relationships as a part of your company’s culture will promote, among other things, alignment. Read more about the importance of alignment here. A good plan is one that allows for accountability throughout the organizational structure. Accountability is only achievable if leaders feel comfortable claiming their budget as their own. Invite key team members to early planning meetings and give them a framework to work within as they develop their portion of the plan. A plan that is developed at the top, without input from those who will be working the plan, is bound to fail. While pushing a budget plan out to the organization from the top down is problematic, communicating the importance of the planning process from the C-suite is critical. If the top leader isn’t bought in and engaged, others in the organization will adopt that posture. Additionally, communicating the results of the budgeting process throughout the organization is very important and kickstarts the accountability process. Developing a cadence of reporting and analysis that provides budget to actuals reporting keeps the plan and its strategic objectives a focal point for the organization. Allowing for reforecasts and budget adjustments when necessary will ensure that your team remains engaged in the plan. Effective budgeting and planning can be a struggle for small businesses. However, companies that commit to these principles can turn a process that usually garners eye rolls into a strategic tool that excites employees, creates accountability, and propels the organization forward.